October 2015: Best Restaurant/Best Mexican Restaurant/Best Taco on OC Weekly's "Best Of" list. 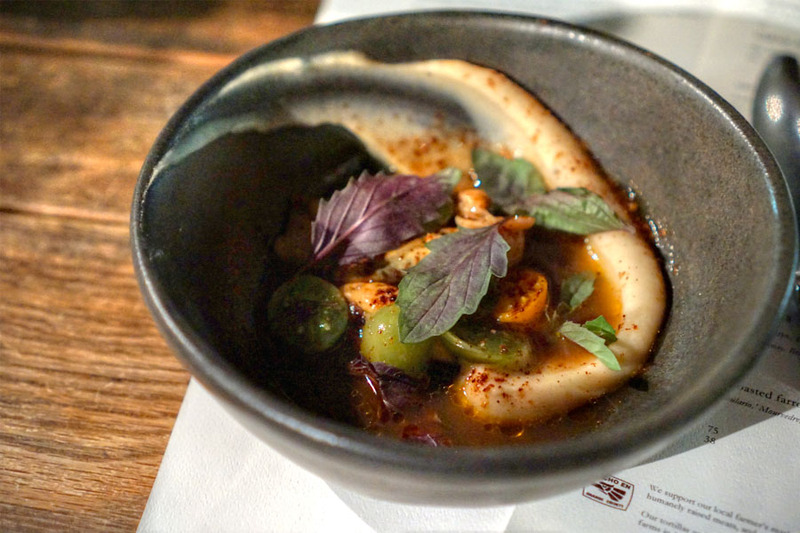 November 2015: #2 on Jonathan Gold's list of "101 Best Restaurants" in the LA Times. January 2016: "Chef of the Year" for 2015 from the OC Register's Brad A. Johnson. 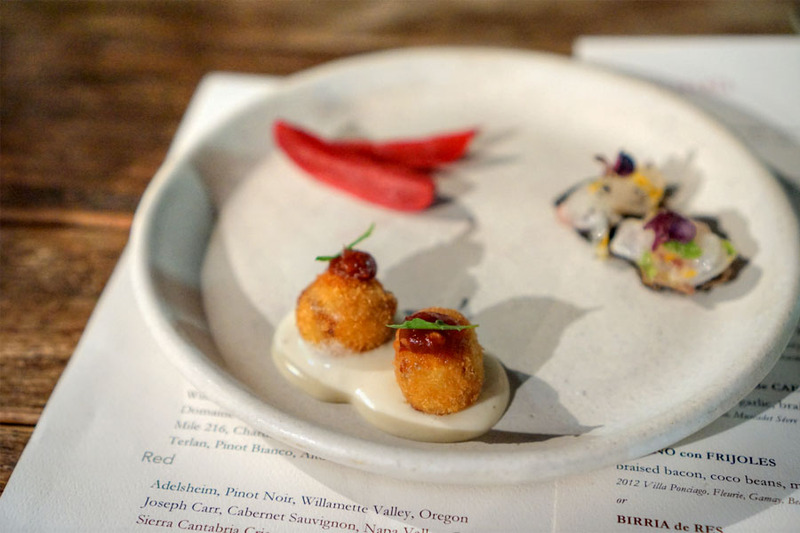 February 2016: Semifinalist for James Beard's "Best Chef: West" award. April 2016: #1 on OC Register's list of "75 Best Places to Eat." October 2016: Best Restaurant on OC Register's "The Best Restaurants in Orange County of 2016" list. October 2016: #5 on Jonathan Gold's list of "101 Best Restaurants" in the LA Times. ...And the awards keep rolling in for Carlos Salgado's Taco Maria. Since my last meal here, the restaurant has continued to garner considerable acclaim, and thus I figured it was about time for a quick revisit. 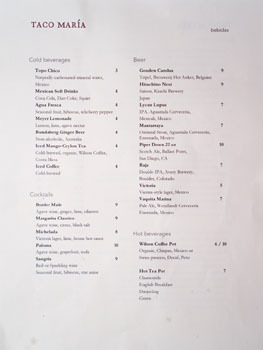 The menu retains its familiar four course parallel prix fixe format. 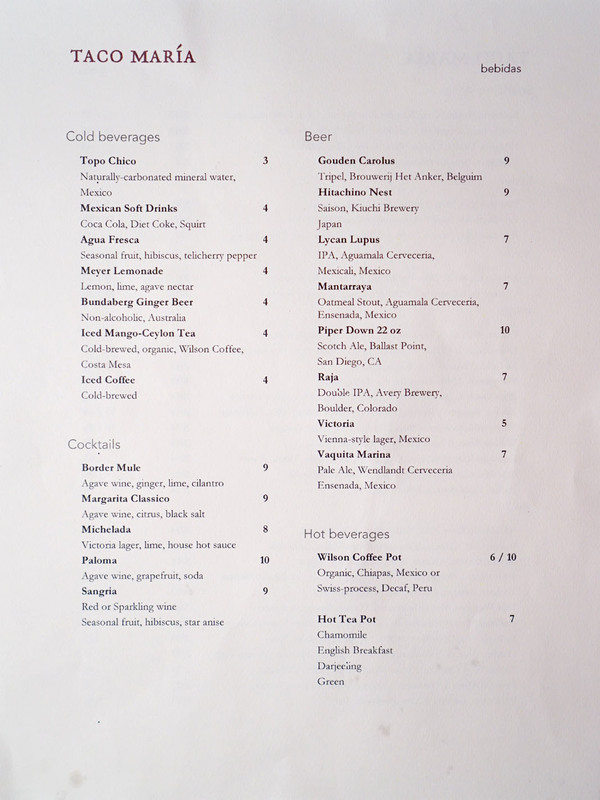 Inevitably though, as the restaurant's profile has risen, so have prices. You're now looking at spending $75 plus $38 for wine, compared to $65/$29 a year ago. You can still go à la carte Tuesday evenings and during lunch though, and a Sunday brunch option remains. 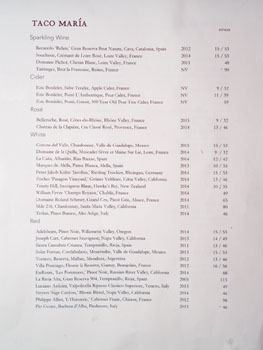 Drink-wise, you've got a small wine list (now managed by GM/Sommelier Wendy Robb), a handful of beers, and a couple low-ABV cocktails. Click for larger versions. Cubes of pork trotter "milanesa" with queso oaxaca, chipotle, and epazote. Think crisp yet creamy, with loads of porkiness mixed with light smoke and a touch of spice on the finish. Clean, lean Japanese sea bass topped with tangy Meyer lemon. Excellent crunch and umami from the paired nori chip, too. I could've used a few more of these guys. Crunchy, tart slices of hibiscus-pickled radish that worked as a sort of palate cleanser. 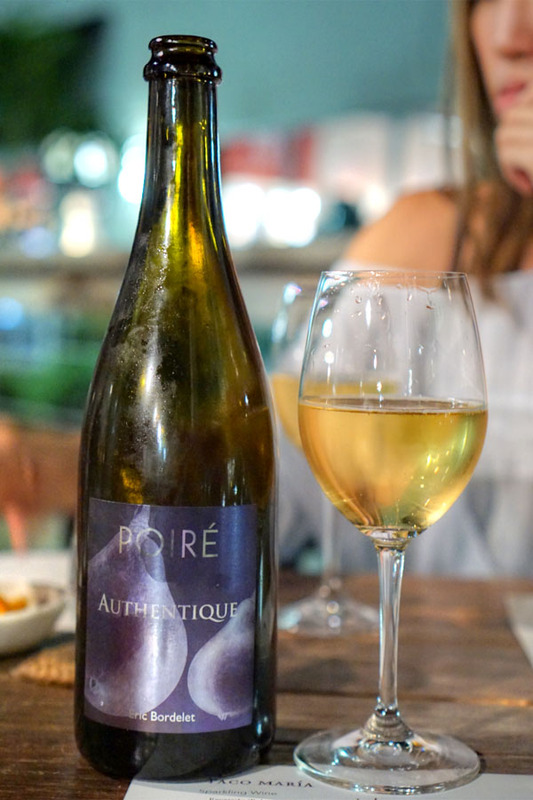 We opted for a couple bottles this evening in lieu of the pairing, and got started with the Eric Bordelet, Poiré L'Authentique, Pear Cider, France, NV [$39]. This was a fun one, showing off loads of rich, sweet pear, but also a funk that prevented the cider from becoming too cloying. 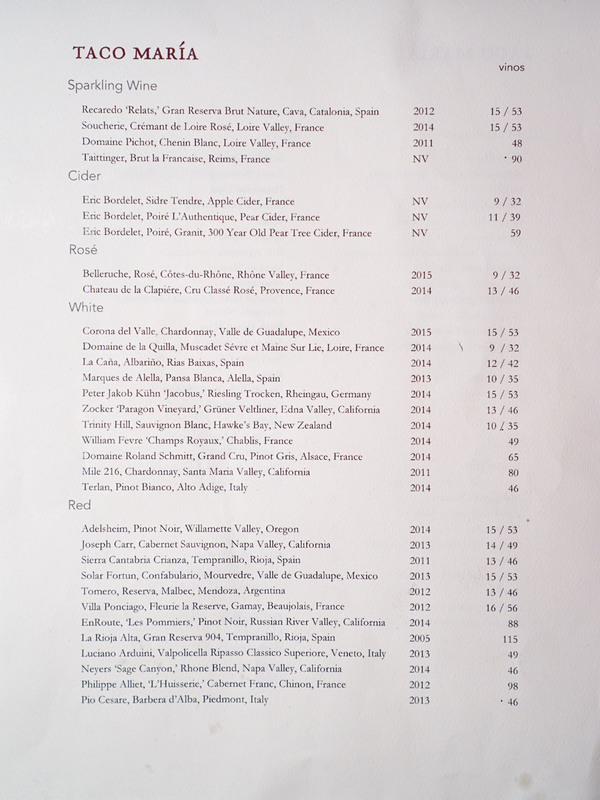 Coincidentally, I'd actually had this not long ago at Bestia. 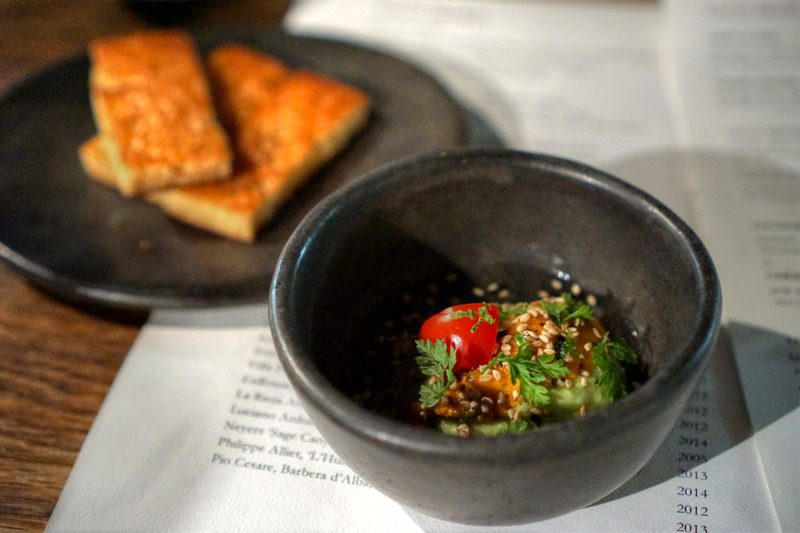 In our first proper course, avocado arrived super bright, its sweetness meshing beautifully with tomato while the brine of the sea urchin came up on the finish. Nice moderating effect here from the toasty brioche. 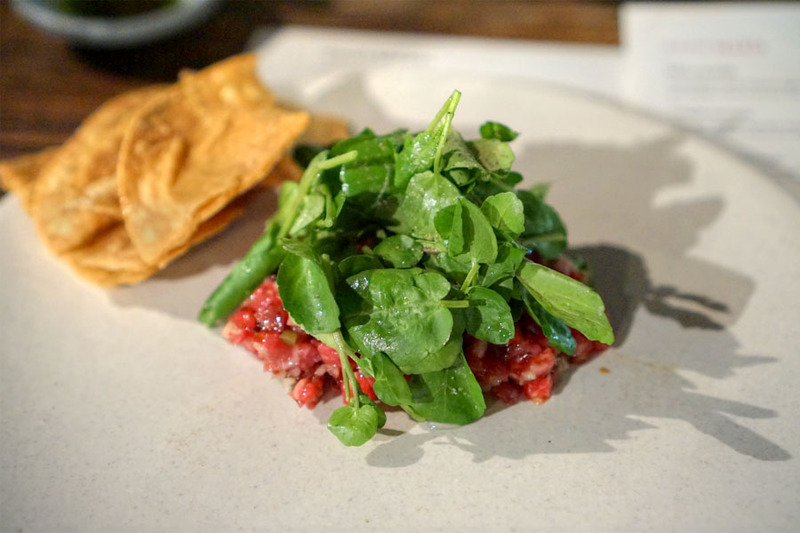 Next up was a favorite of mine, in effect a Mexican steak tartar that I don't hesitate in calling one of the best tartares I've ever had. The meat itself I found perfectly textured--springy almost, yet substantial--and brimming with beefy, garlicky savor and just the right amount of lingering spice. To that we add peppery cress, a helping of bright, zippy cilantro oil, and the crunch of the tortilla chips to finish things off. 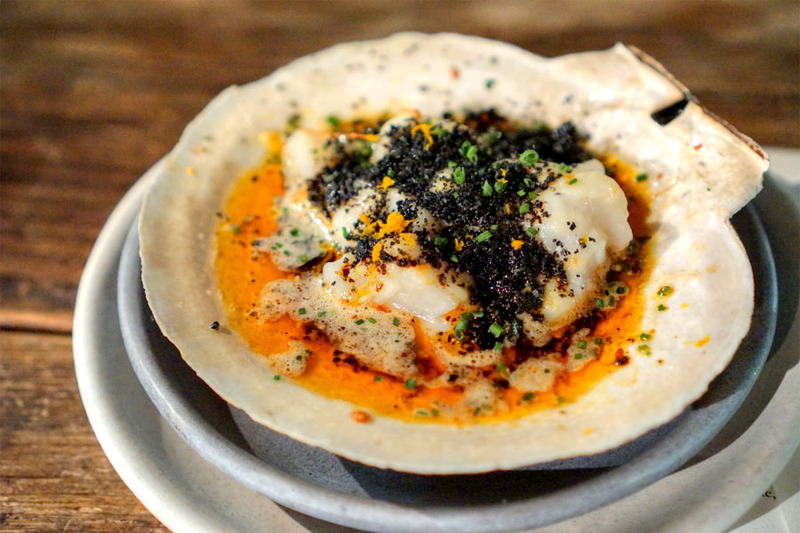 Scallops made for a surprisingly effective gratin, their relatively subdued flavors working as a base for the deep, smoky flavors at play as well as the heft of the cheese. A hearty course for sure, though I think I would've preferred a rarer cook on the scallops. This is the only taco I've had at Taco Maria, and it was another standout. The fish arrived soft and wonderfully smoky, matching the pungency of the morita salsa and its crunchy bits of peanut. There was an additional bit of brightness from the cucumber as well, and I loved the crispness on the tortilla for textural variation. One of the best tacos I've eaten, actually. 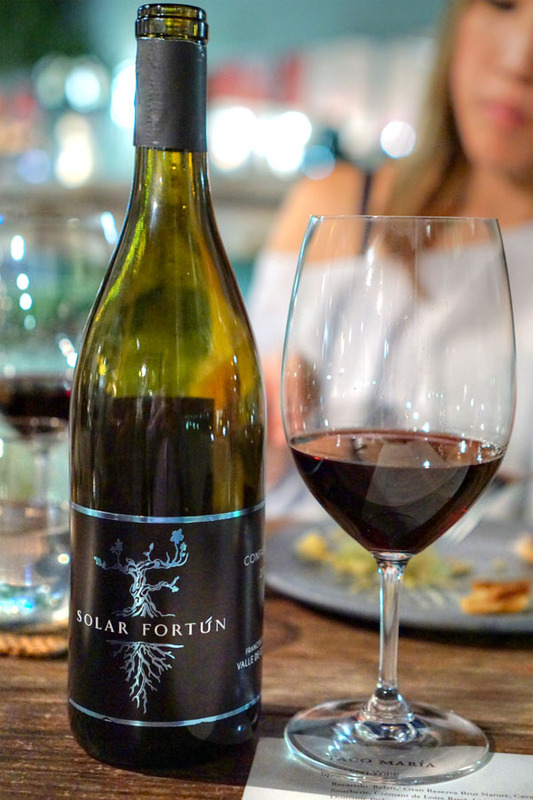 Our second bottle was the Solar Fortun, Confabulario, Mourvedre, Valle de Guadalupe, Mexico, 2013 [$53]. Nose here was inky, intense, with considerable amounts of dark berry. Taste-wise, I got more of that dark fruit, along with a spicy, tobacco-like quality, some vegetal notes, and a layer of alcoholic heat underneath. Preserves of clams and mussels showcased salinity commingled with sweet, warming spice and a touch of heat on the close. 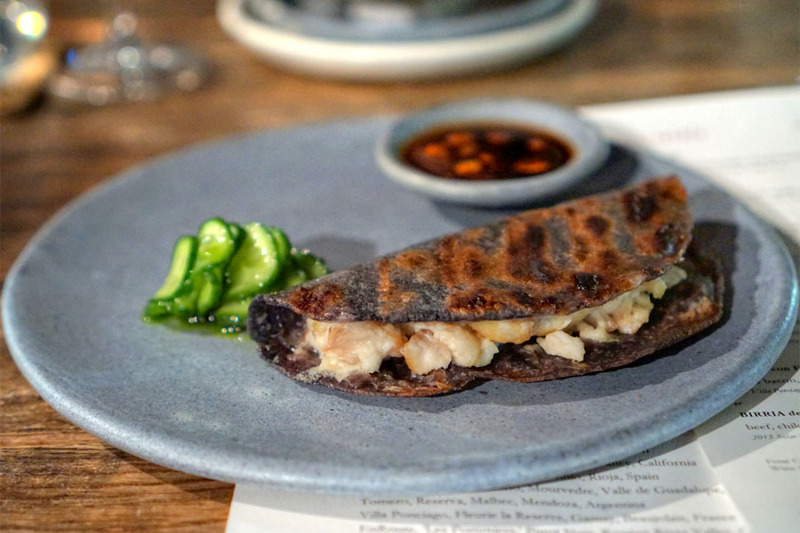 Even better when eaten with the included potato flatbread, which I found delicious and multifaceted even on its own. 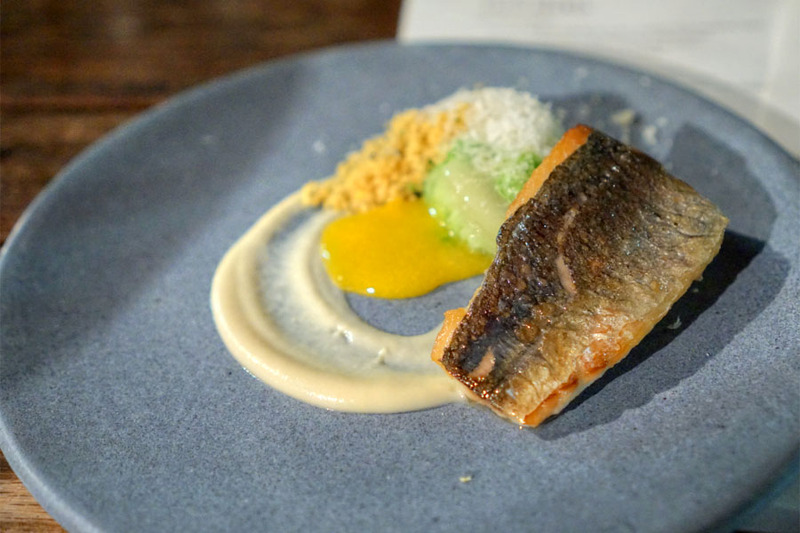 Mackerel was perfectly prepared: crisp skin, soft, juicy flesh, and just the right amount of brine. I was a fan of it just by itself, but the eggy-cheesy Caesar flavors actually made for a surprisingly smart complement. Great crunch from the romaine as well. 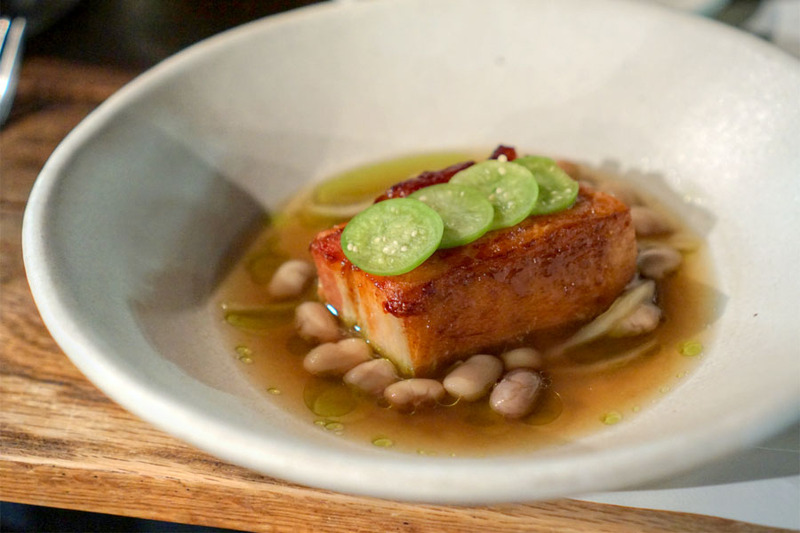 A block of pork belly brought a good balance of lean to fat, with a crispy skin to boot. I found it expectedly porky at first, but with a sweetness creeping in later that I enjoyed. Big fan of the beans here as a counterweight to the meat. 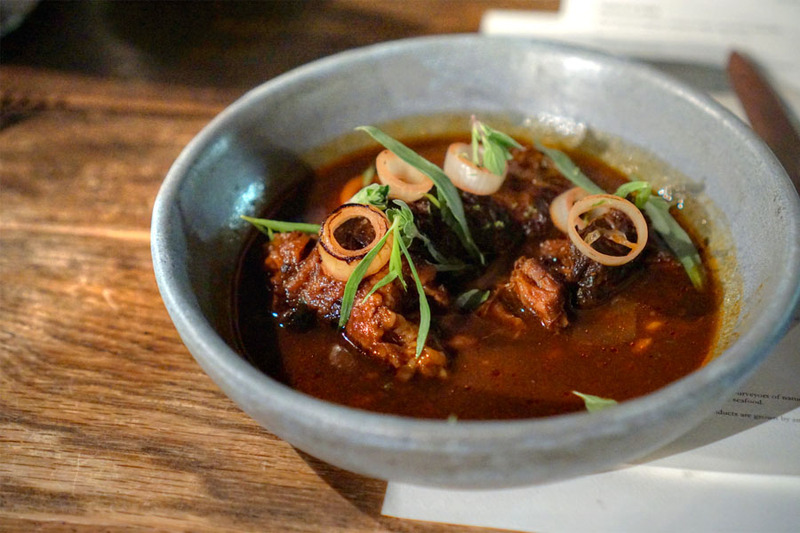 Last up was a stew, one with its tender chunks of beef imbued with an unabashedly deep, penetrating spice and a tangy, almost floral character. Great use of the farro as a contrast too. 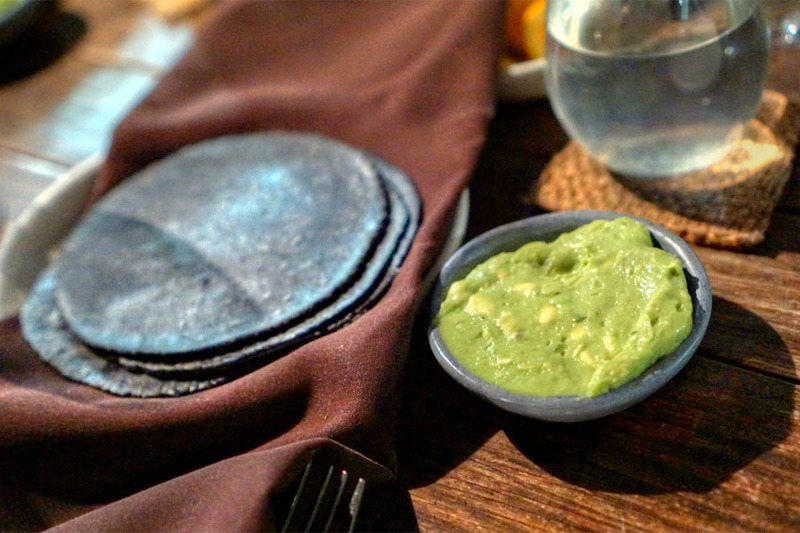 I found the dish gratifying alone, but even better when folded into a tortilla with a dollop of the excellent guacamole and a dash of the included hot sauce. There was still no dessert course this evening, a fact made all the more painful given that Salgado was formerly Pastry Chef at both Commis and Coi (coincidentally, I've actually had his desserts at both restaurants). 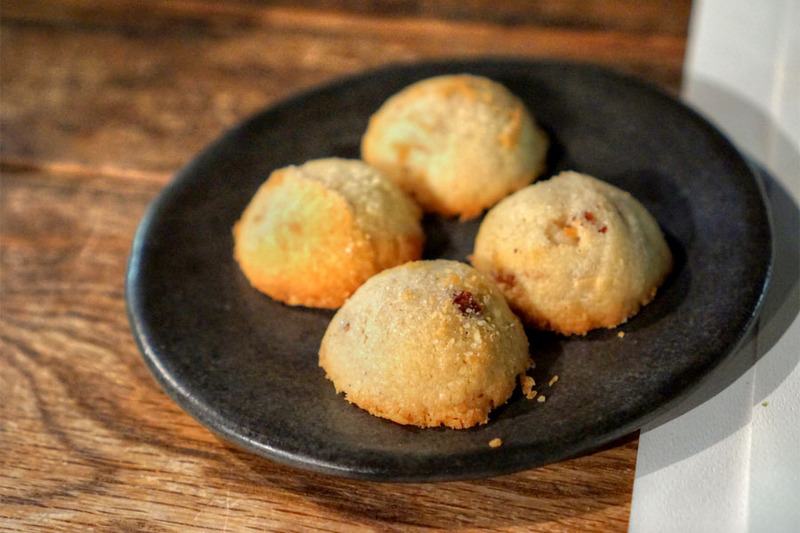 Rather, we had a quartet of soft, buttery, crumbly polvorónes (almond shortbread cookies with anise) to close, which, curiously, one of my dining companions likened to Chinese almond biscuits. Not surprisingly, we enjoyed yet another strong meal from Salgado and his team at Taco Maria, and it was fun to see how the Chef's cooking has evolved over time. The restaurant's accolades are deserved, so I'd definitely come check the place out if you haven't already. I think we're all just waiting for a proper dessert course at this point! I cannot endorse this post. Anonymous cannot endorse this post!? Who are these yahoos on your blog Kevin? Great post, well done Kevin.